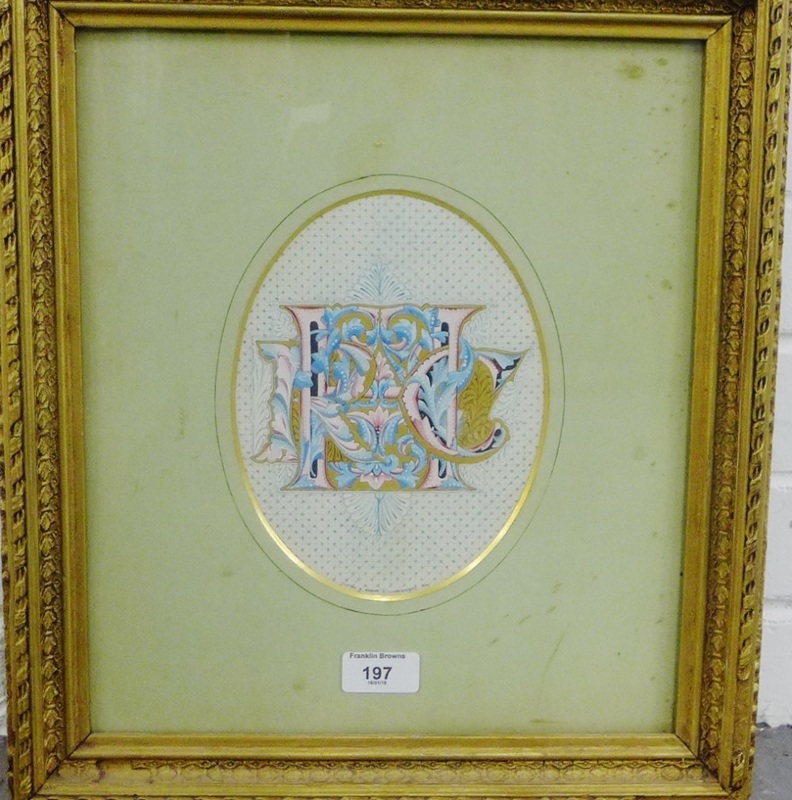 Clifton and Senior Illuminators &amp; Co, book illustration in a glazed and giltwood frame with an R.
Clifton and Senior Illuminators & Co, book illustration in a glazed and giltwood frame with an R.
Unfortunately, your registration has been declined by the auctioneer. You can contact the auctioneer on 0131 657 4162 for more information. You are the current highest bidder! To be sure to win, log in for the live auction broadcast on 19 Jan 2019 10:30 GMT or increase your max bid. We offer a limited packing service within the UK and at the Auctioneer's sole discretion. As we are restricted to what can be included in this service, it is advised that you check with the office before bidding. For instance we can only pack single lot items with a value below £500 and we DO NOT post glazed paintings or mirrors, extremely fragile items to include pottery, porcelain and glass, arms and weaponry, or heavy and large sized goods. The minimum tariff for posting and packing is £15.00 per item, however all clients must agree to absolve Franklin Browns Auctioneers & Valuers against any loss or damage that may occur whilst using Royal Mail Services. All liabilities are with the buyer. ALL LOTS MUST BE COLLECTED BY WEDNESDAY 23rd January 2019. ONLINE BUYERS MUST PAY BY BANK TRANSFER . WHEN PAYING BY DIRECT BANK TRANSFER FROM A NON UK ACCOUNT OVERSEAS BUYERS MUST ELECT TO PAY OUR BANK CHARGES. WE SHALL EMAIL OUR BANK DETAILS TO YOU DIRECTLY. INTERNATIONAL BUYERS MUST ARRANGE FOR COLLECTION BY 5PM ON THE WEDNESDAY FOLLOWING EACH SALE. THEREAFTER A DAILY STORAGE CHARGE OF £1 FOR SMALLER ITEMS AND £5 FOR FURNITURE AND LARGER ITEMS WILL BE APPLIED. ALL CONDITION REPORT REQUESTS TO BE RECEIVED BY 4PM ON FRIDAY 18th January 2019. The buyer shall pay the hammer price together with a premium thereon of 15% plus VAT on the premium at the rate imposed by law. All lots bought through www.the-saleroom.com will attract an additional buyer's premium of 4.95% plus VAT. Value Added Tax on the hammer prices is imposed by law on all items affixed with an asterisk. Value Added Tax is charged at the appropriate rate prevailing by law at the date of the sale and is payable by buyers of relevant lots. Pay to us the total amount due in cash or in such other way as is agreed by us. We accept cash, debit card, bank transfer (details available on request) and banker's draft in pounds sterling. Debit card payments can only be accepted if the buyer is present. We do not accept American Express, Diners Club or Credit Card. Any payment by you to us may be applied by us towards any sums owing from you to us on any account whatever without regard to any directions of you or your agent, whether express or implied. The ownership of any Lots purchased shall not pass to you until you have made payment in full to us of the total amount due. While prospective buyers are strongly advised to attend the auction and are always responsible for any decision to bid for a particular Lot and shall be assumed to have carefully inspected and satisfied themselves as to its condition, we will if so instructed clearly and in writing execute bids on their behalf. Neither the auctioneer nor our employees or agents shall be responsible for any neglect or default in so doing or failing to do so. Where two or more commission bids at the same level are recorded we reserve the right in our absolute discretion to prefer the first bid so made. Please note that all lots bought through www.the-saleroom.com will attract an additional buyer's premium of 4.95% plus VAT. You will pay 15% of the hammer price of each lot which sells. Loss and Damage Warranty is 1.5% on value of lots sold and a £2.00 per lot lotting fee will be applied and this will include photography and marketing, etc. Franklin Browns reserves the right to charge a Withdrawal Fee of up to 10% of the reserve or lower estimated selling price and to return any items to the Vendor at the Vendor's cost. Whilst Franklin Browns makes every effort to describe lots accurately, it may be impractical for us to carry out exhaustive due diligence on each lot. Prospective buyers and any independent expert acting on the buyer's behalf are given ample opportunities to view and inspect before the sale and they must satisfy themselves as to the accuracy of any description applied to a lot. Prospective buyers also bid on the understanding that, inevitably, any representation or statement by us as to authorship, genuineness, origin, date, age, provenance, condition or estimated selling price is a statement of opinion only. Subject to the foregoing neither the auctioneer nor its employees or agent nor the seller accept liability for the correctness of such opinions and all conditions and warranties, whether relating to description, condition or quality of Lots, express, implied or statutory are hereby excluded. This Condition is subject to the next following Condition concerning deliberate forgeries. Franklin Browns Ltd reserves the right to amend these Conditions of Sale at any time and without prior written notice.